Hello. This is the first Evening Pilgrim blog post. The image pictured at right offers a pattern of symbols representing ideas from a book by Israel Regardie titled, “A Practical Guide to Geomantic Divination.” Mr. Regardie was an enthusiast of mystic traditions, and the word “geomantic” refers to the Earth. When engaged in the form of divination Mr. Regardie describes, a person seeking insight randomly scratches the earth with a stick while considering a question. Then, by grouping the scratch marks into odd and even sets, symbols in the book are referenced. 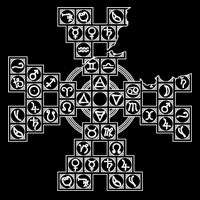 Each symbol corresponds to ideas that can be interpreted as suggestions.